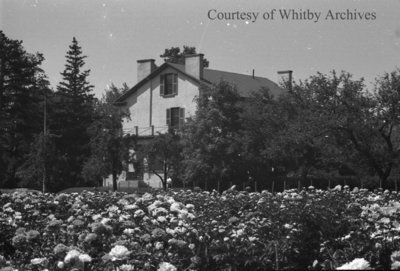 A black and white negative of the rose garden at 201 Pine Street. The side of the house can be seen in the background. This house was located on the north-east corner of Mary and Pine Streets and was known as the Grange. The Grange, c.1937, Marjorie Ruddy. Whitby Archives A2013_040_665C.